Out of all the myriad forms of artistic expression found at festivals today, many are grandiose achievements by incredible men. But the hearty warmth, nurturing, and acceptance that pervade these places are divinely feminine. Perhaps the archetype who best captures this quality is Crimson Rose , the fire performance community's celebrated heroine and a founding board member at Burning Man. Often hailed as "the godmother of fire arts" (she was the first-ever fire dancer on the Playa), Crimson reviews conclave auditions with a panel of legends to select the crème de la crème for the ceremony. Year after year, fire performers strive just to be a part of her continued legacy by pouring their souls into their Burning Man performances so the tradition is passed with grace on to the next generation. That magic, for a lot of fire performers, is the hottest part of the flame. “On one side,” she continued, “When playing with fire you have to be very conscious and very grounded because [otherwise] you'll burn yourself. But there's this other extreme where it will take you into another place.” Turns out, as a meditative tool, the fire actually plays a role in the dance. “It was also as if the fire was sort of leading me on its own journey. 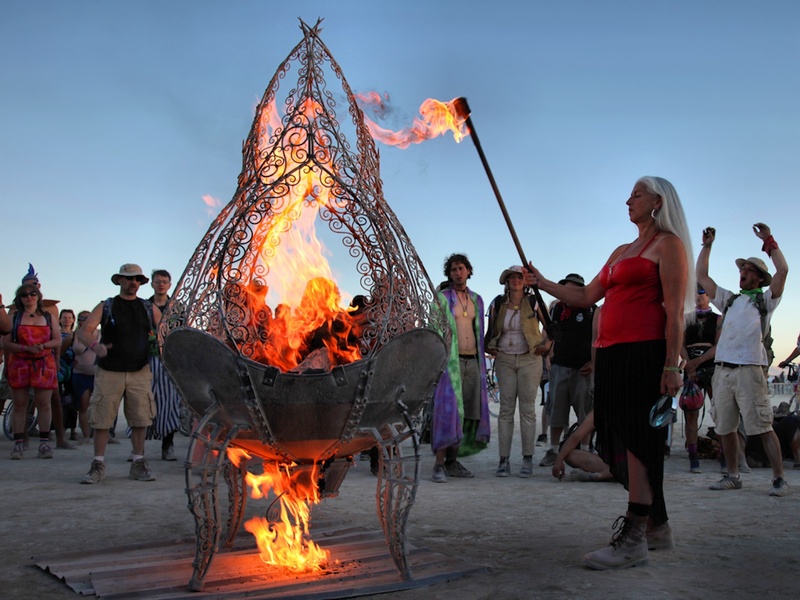 Sort of provoking me to bring it to life.” Without question, that’s exactly what she did – now the Burning Man Organization receives applications for almost 50 groups each year to bring fire dance to the Playa. We asked how she got involved with this desert social experiment in the first place. She thought for a bit, and took us back to a time before that first dance, to an email and a phone call with the man often accredited with launching Burning Man, Larry Harvey himself. “In 1990, I had a conversation with Larry Harvey and he talked about a thing they were doing. He had sent me a video of what they did the year before. It was really dark. It was a lot of fire and I couldn't figure out what the hell they were doing." In 1991 the Man was on a barge at Fort Mason in San Francisco, and he was horizontal. A group of people were standing holding a rope (that's how they used to hoist the Man upwards), which confounded Rose. “Okay,” she said to herself sarcastically. “I'm gonna be really cool because I don't know what the hell these people are doing. They started pulling and a man raised up, and something clicked in me.” Crimson explained. “I didn't know what it was. But I knew that I had to go to the desert.” Footage from the prior year continued to beckon her to visit. Seeing a man in the film breath the fire that ignited the effigy was enough to inspire the trip. As fate would have it, they both agreed to meet in 1991 in what eventually came to be known as Black Rock City. At the center of her magnetic attraction this new subculture was this effigy, over which Crimson grew protective. In one of her first encounters with it, “one of the very first things I did is I had these 16-foot-wide silk wings that I wore as I climbed the Man.” People were astonished to look up and see what looked like a fairy climbing to the top of the figure's shoulder. “I felt like that at that point, I was the protector for the Man. If the Man was going to be released we had to do it in the best way that we could, so that year I got a chance to actually help set him on fire.” For the first time, the magic of dance kicked off the legendary ceremony. 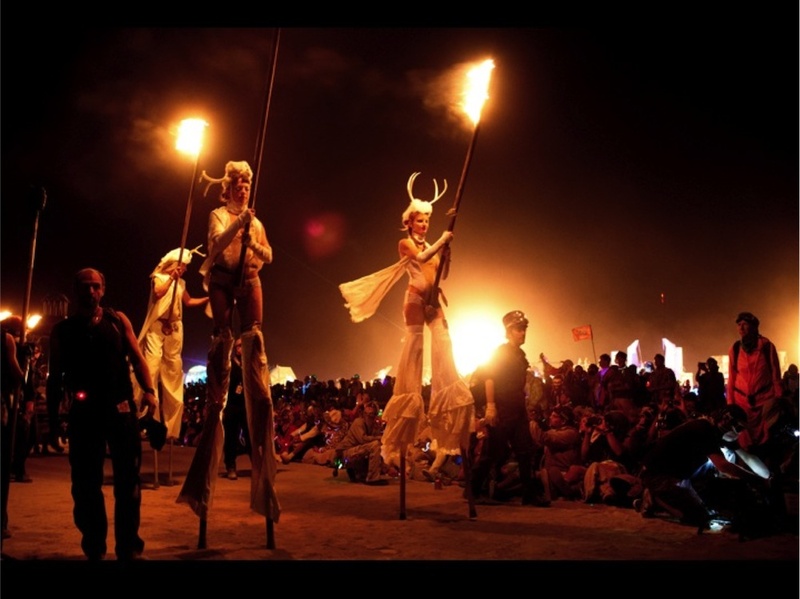 Word quickly spread about Rose's first fire dance on the Playa and slowly, other dancers started coming. With little structure or organization to the fire performances, safety understandably became a concern. Fire dancing at Burning Man spawned greater mysticism and creative energy, along with an appreciation for the accompanying rituals and traditions from which fire dancing came. A couple of decades on, the question of the importance of fire rituals in the Burner community begs to be asked. To this, she said, “What I found is that ritual is something which had evaporated in our culture. Now we don't normally celebrate it and for myself that has always been a big part of my life." For Crimson, the reverence and appreciation she holds for ritualistic fire dancing has deepened her connection to the Playa. In this duality, Crimson illustrates that survival and humility are not to be taken lightly, whether you're dealing with fire or the desert. It's through these traditions that we find new journeys to share that can enrich both our communities and our lives.